PM Training has been awarded a ‘Supplier Excellence’ award at the Douglas Macmillan Hospice Business Partnerships Awards 2019. The award ceremony took place on Friday 8th March at the Bet365 Stadium and celebrated the work partners do across Staffordshire supporting the Douglas Macmillan Hospice charity. 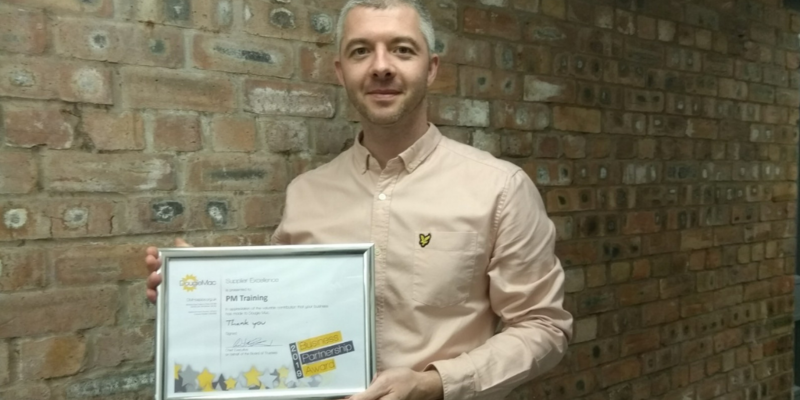 PM Training were awarded ‘Supplier Excellence’ for their handyman service which started in 2018. The service involves refitting shops, plumbing, painting and decorating, building and refurbishment. The service also involves training apprentices who assist with the work while learning important trade skills to further their development and career. Apprentice, Charlie Key said: “I love being part of the handyman service. I’ve had a lot of great feedback from the families supported and know that our work is having a positive impact in our communities”. The three-year handyman service is funded by Realise charity, at an estimated cost of £150,000. Rich Kettrick, Homeworks Contracts Manager at PM Training said: “This award is a great accolade to the team for the work they do. Brian and his apprentice, Charlie, do great work upgrading shops across the city and our partnership with Dougie Mac goes from strength to strength”. Each year, PM Training supports more than 250 young people into apprenticeships and sustainable employment with additional support from the Realise charity; including employability initiatives and driving lesson support.